This is a beginner’s book for people starting on the path of becoming a shaman in a European tradition. It’s specifically a Northern Tradition book, but is applicable to other heathen paths. A lot of the stories and exercises would be of interest to pagans and polytheists who are not interested in becoming a shaman, but just want to develop some elemental magic or spirit relationships. This book was supplied to me by the publisher, Destiny Books. The file of this book is huge to the point where it had trouble loading on my Kindle. That is because the first section is chock full of gorgeous full color photos of sacred objects. The authors define what a shaman is and does in their tradition. They define the major types of shamanic traditions, which are empowerment traditions and specialist traditions. An empowerment tradition teaches how to better oneself, and a specialist tradition teaches how to serve the community in a trade. The Northern Tradition is a specialist tradition, but in this book the authors extract parts of their tradition that anyone can use. This is a workbook, containing many exercises. It’s not meant to be read straight through at one go. Doing all the exercises one after another would be too draining. This book is best used one chapter at a time, or even just one exercise at a time. For that reason, it will take some time to work through it. Despite the title, this book is not about how shamanism was practiced in the Neolithic Age. Rather, it’s a guide for the modern witch interested in learning a path focused on spirit relationships with the elements and other beings that were important to Neolithic shamans, such as the sun. Those hoping for a history-focused book should look at a more academic book rather than this guide for the modern practitioner. Heathens interested in a path that is focused on landwights and ancestors rather than gods will find this useful. This book is divided into chapters dealing with the various elements and the sun and moon. The first chapter is about the earth element. It deals with land spirits, including home and city spirits. The basic information on relating to the land would be of use for any magic user, not only those on a path based on Northern European culture. The chapters have overviews of historical information. For example, the chapter on the sun tells about the solar vehicles of various cultures. The two authors each relate stories about their personal experiences with each of the elemental spirits described. The stories are enjoyable, and worth reading even for the merely curious who are not actually doing the exercises. The spirits have names and personalities. Some of the names are recognizable from folk traditions, such as Jack Frost. Different spirits from the same element can have very different personalities, such as the Four Winds. The section on plants contains information that someone whose path centers on their garden might find especially useful. The greenwights as described in this book remind me of the plant devas in the book Behaving As If the God In All Life Mattered. The section on animals makes useful distinctions between spirit animals, totems, ancestral totems, and the spirits of individual animals such as a familiar. The information on ancestral totems such as Bear dovetails with my own knowledge about them. In the water section, the parts about how to make friends with the spirits of wells and rivers are things any pagan or magic user could use, even those on different paths. There are also some parts that probably will only resonate with those who are actually interested in pursuing a shamanic path, such as the theory and practice of sacrificing one’s own blood. In the fire chapter, I was amused to find the authors advocating learning to make fire by flint and steel, since obviously the ancestors in the Neolithic Age did not use steel. The authors do write about the firebow and fire twirl, the classic Boy Scout rub-sticks-together method of making fire, but they don’t use that method themselves. However, that’s my reaction as someone whose path is heathen but not specifically Northern Tradition. In Asatru, I am used to practices being either fully reconstructionist or fully modernist, so this struck me as odd. I’m sure any fire making method would help someone on this path learn about fire. After all, as the authors said in their introduction, this is not a reconstructionist path, but a new modern path based on ancient powers. I loved the chapter on crafts. It expressed some things I’ve felt instinctively but had never seen written out before. Objects with names have spirits. They can develop their own personalities, quite separate from whatever intention was put into them when they were made. This is not an academic work and cannot be judged by academic standards. It’s a basic how-to for the modern shaman. 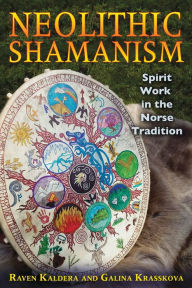 I recommend it for those interested in learning spirit work based on heathen culture, either within the Northern Tradition or a related path.